|#kidsstickerswap|Easter sticker swap - sign-up now open! Wow! It's #kidsstickerswap time again, when I talked about having a break between Christmas & Easter it seemed so far away but it feels as though I've blinked and here we are! I did intend to publish this last weekend but we have had a rather eventful few days and so I'm a few days behind, I apologise! So the big news is that we actually have a sponsor! Sticker stocker have very kindly agreed to sponsor this event for us look out for some posts from me showing what T and I have been up to with some stickers from them. We also have some fabulous prizes and discounts to dish out for the Easter #kidstickerswap members! As usual the budget is £10 including postage so if you can send second class I'm sure you could get a lovely package of stickers to send on to your swap partner. Suggested age for this swap is 2-7 but this is not mandatory. Other items can be included but primarily stickers please, check out this post for some ideas of things to include, a few little chocolatey treats are also welcomed too! I'll be closing sign-up to this swap on Monday 16 March and swap details will be with you by Wednesday 18 March which gives a couple of weeks to get your package together and posted to be received by your swap partner by 1 April. 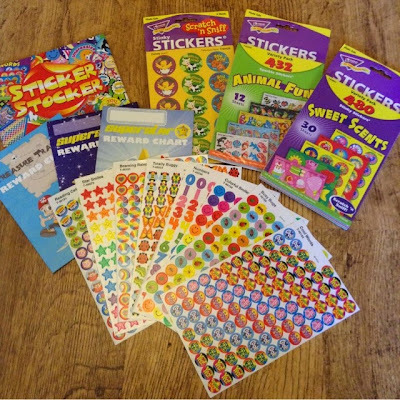 Even if you choose not to join the easter #kidsstickerswap I really do urge you to go over to Sticker Stocker and have a look at what they have to offer, as well as fantastic stickers they also sell some wonderful educational products for children, offer 10% discount from your first order and free UK postage!